We rowed out through the harbor, past bobbing boats weeping rust from their seams, past juries of silent seabirds roosting atop the barnacled remains of sunken docks, past fishermen who lowered their nets to stare frozenly as we slipped by, uncertain whether we were real or imagined; a procession of waterborne ghosts, or ghosts soon to be. We were ten children and one bird in three small and unsteady boats, rowing with quiet intensity straight out to sea, the only safe harbor for miles receding quickly behind us, craggy and magical in the blue-gold light of dawn. Our goal, the rutted coast of mainland Wales, was somewhere before us but only dimly visible, an inky smudge squatting along the far horizon. And with that first paragraph, Ransom Riggs proves yet again why he is a master of creating atmospheric novels. I would say even more than the story itself, his ability to set the mood is his niche. 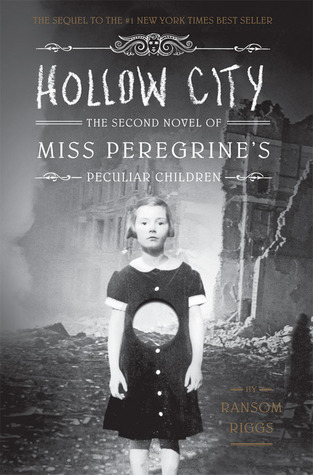 Hollow City is the second book in his Miss Peregrine series, but as you find out on the last page, it will not be the last. In this installment the Peculiars flee to London but are met with even more danger as they encounter Miss Peregrine's dangerous brother Caul who is able to steal Peculiar abilities. Just like in book one, the reader is met with a series of photographs to enhance the narrative and while the photographs in the first book live up to the word Peculiar in the title, I found that the pictures in this book weren't as compelling. The composition of the photographs in this volume don't beg the reader to stare curiously for lengthy spans of time the way the photos in the first book do. However, what theses photos do accomplish for the reader is giving us a glimpse of how writers can use visual inspiration to tell a story. Many authors do this behind the scenes when researching their novels, but Riggs put this process right into his stories. This could be an interesting writing exercise or full-blown project to do with students: give them a series of photographs they've never seen before and ask them to incorporate them into a story. I'm looking forward to seeing how Riggs extends this process in book three. I saw the book trailer for this and it was so good. I haven't read the first book, though, but I love the cover design!